Waste not want not! Did you know that you can go one step further in your kitchen and not just find ways to eat everything up, but also regrow from scraps? With some types of foods, as long as a bit of the food is leftover, you can regrow it to get a second harvest for free! No, not all of them will regrow a full item again, but it will grow something that is usable. 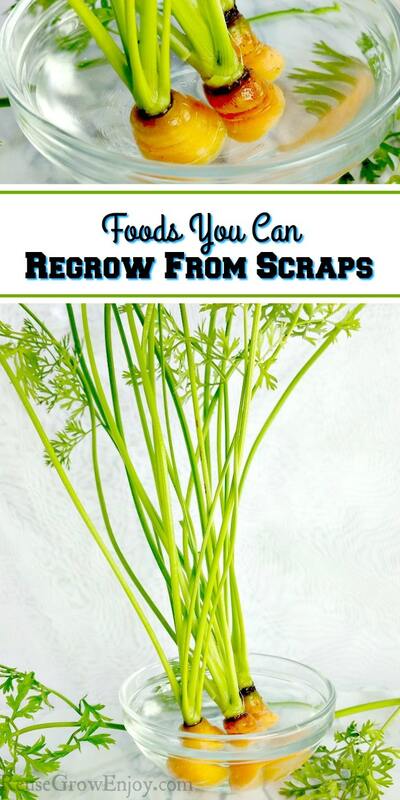 Here are Foods You Can Regrow From Scraps! 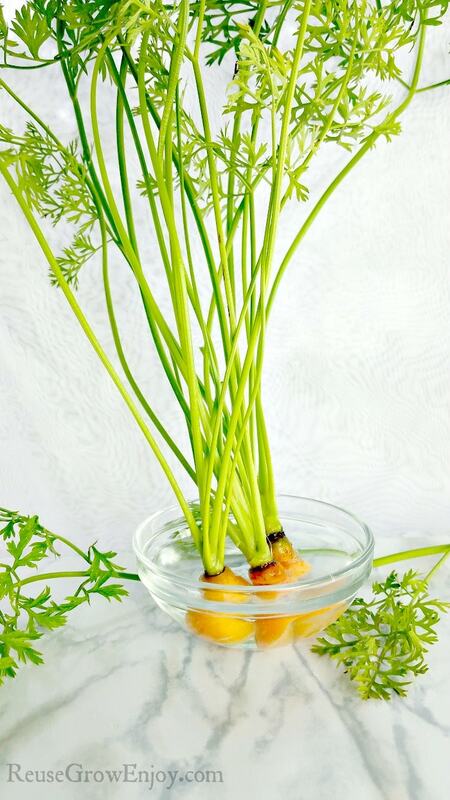 Now you can not regrow a whole carrot, you can regrow the tops from scraps. Tops can be used as a garnish or even in some dishes. They do have a slightly bitter taste so not great to eat on their own. To regrow carrot tops, simply cut about an inch of the carrot (the end where the tops would come from) in a shallow dish of water. You want the water to just cover the carrot and not the top area. Place the dish in a bright area but not right in the sun. Change the water every few days. Then simply clip off the tops as they grow or as you need them. It’s really easy to regrow celery from scraps! All you need is 2 inches of the bottom from a head of celery. Put this in a dish or bowl with about 1 inch of water in it and put it in a sunny place. Change the water every day or two. After a week you should see some new leaves growing. The outer stalks may also be turning brown and rotting, but that’s to be expected. At this point, you can either keep on water or go plant your celery in the soil, either out in your garden or indoors in a pot. Make sure the new leaves are sticking out of the dirt. If you care for it well enough, in around 5 months it’ll be fully regrown and ready to eat again! Lemongrass is technically an herb, but it grows like a grass and is easy to regrow. All you need is an inch or two of the stalk with the bottom bulb still attached. Place this in a jar of water in a sunny location, then wait for new roots to grow (which can take 1-3 weeks). Change out the water every few days. Once the lemongrass has roots that are 1-2 inches long, it’s time to plant the lemongrass in dirt (in a sunny location) outside or in a pot inside. Once the plant is a foot tall and the bottom of the stem is 1/2 inch thick, it’ll be ready to harvest and eat! Potatoes are another food that’s really easy to regrow from scraps. Just cut a two-inch piece off of a raw potato, ensuring that there are 2-3 eyes on that piece. Set that out to dry for 8 hours (or overnight), to prevent rot, then plant it in dirt in a sunny location (or in a container). Plant it 4 inches deep and place it so the eyes are facing upwards. Then tend to it as it grows. In about a week you’ll see that the potato is growing nicely. You can harvest it as a baby potato when the plant starts to flower, but it’ll be really finished growing when the plant dies. Then you’ll have grown a whole new edible potato! You can also regrow sweet potatoes from scraps, but the method is a bit different from regular potatoes. Sweet potatoes should be started by taking a cut half of a sweet potato and putting it in a jar of water. You should spear the half of potato with toothpicks on the side so that they hold half of the potato above the water, the toothpicks balancing on the jar rim. Put your potato jar in a warm, sunny location. 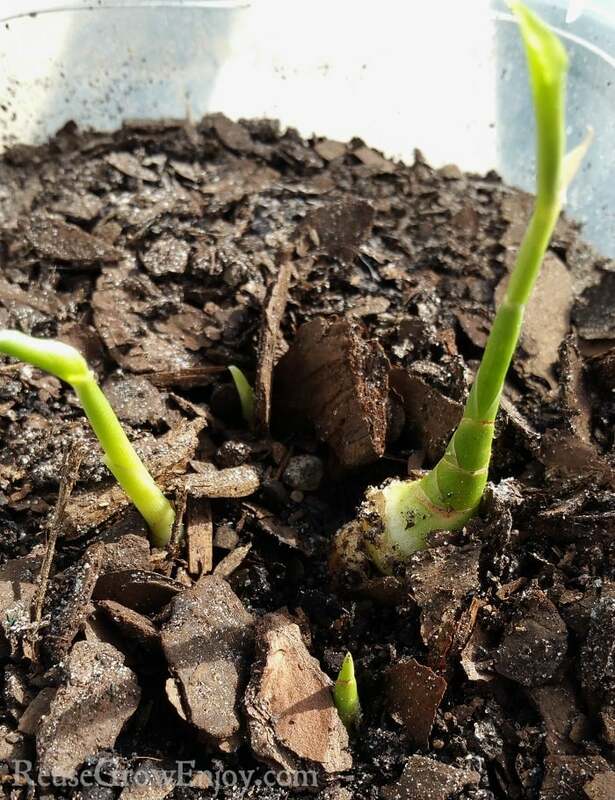 Roots will start to grow in a couple of days, as will sprouts on top of the sweet potato (these are called slip sprouts and a single sweet potato can grow a lot of them). Wait until the sprouts are around 4 inches long, then remove them by twisting them off of the potato. Place the slip sprouts in a shallow dish with water, hanging the slips’ leaves over the edge of the dish to stay dry while submerging the bottom part of the stem. Change the water every day or two. In a couple of days, they will grow roots. Then plant the slips and wait for them to grow into sweet potatoes! 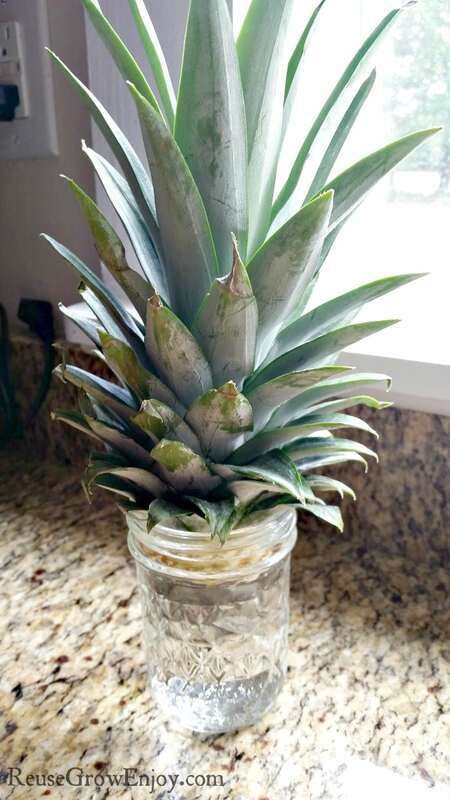 When you cut the top off a fresh pineapple you can reuse to grow a pineapple plant. While this can be done with just about any pineapple you get from the store, organic ones do work best. You can see more details on how to do this in my post on How To Grow A Pineapple Plant. There are so many great foods you can regrow from leftovers! Ginger is another easy one to grow. You’ll need a piece of ginger with at least one yellow/green bud/eye on it. You can make your ginger grow eyes by leaving it out on the counter in a sunny spot for a few weeks. It’s okay if it shrivels a bit during this process. Once your ginger has eyes, cut it up into smaller pieces with at least one eye per piece. Let it “heal” for a couple of hours after cutting before planting. Then plant it in soil, close to the top of the soil, and with the top of the ginger exposed. Ensure the eyes are facing upwards. In a week or two, you’ll see new shoots appearing and the ginger will be growing roots. Give it plenty of water and take good care of it, and soon it’ll grow a nice big piece of ginger! The longer you let it grow, the more ginger you’ll get! Yes, you can regrow onions from scraps! Just cut the root part off the onion, leaving 1/2 inch of onion above it. Place that in soil in a sunny location, with the top covered with dirt, and keep it watered. In about a week you’ll see green stalks growing. You may even get more than one onion bulb out of a single onion (if you see multiple stalks, it’s fine to cut the onion to separate them so they can grow separately). You can either cut the green stalk off and use it as you go or wait until the full onion is grown. Lettuce is a very popular food to regrow from scraps because it’s so easy. Of course, it won’t work if you buy bagged lettuce. You need lettuce leaves with a firm bit of stem/root at the bottom (you’ll find this on “heads” or “hearts” of lettuce). This may not work with all types so try and stick with like romaine or something along that type. If you’re planning to regrow your lettuce, try to tear/cut the leaves off 1 inch from the root when you go to pick the leaves, so a bit of leaf is left behind. When the lettuce head is used up, place it in a dish or bowl with approximately 1/2 inch of water in it. Place this in a sunny location. Change out the water every day or two and watch as the lettuce grows. About 10-14 days after starting this, your lettuce will be ready to pick again! It won’t have magically regrown into a whole new head of lettuce, of course, but there should be enough for a small salad or a couple of sandwiches. That’s right, if you’ve harvested all of your basil, you can regrow it! You just need a 4-inch long stem. Put this in a jar of water, keeping any little leaves above the water. Put this in an area of your kitchen that gets indirect sunlight. In a couple of days, the basil will start to grow new roots. Once those roots are a couple inches long it’ll be time to plant the basil in soil. Then just care for it and watch a new basil plant grow! You can regrow cabbage in a similar way to lettuce. You’ll need 1 inch of leaves above the root. Place this in a shallow dish of water, keeping the leaf part above the water. Place it in a sunny location, and change out the water every few days. You may also want to mist the top of your cabbage every couple of days, so the top doesn’t dry out. Once the plant starts to grow roots you can plant it in soil, or just harvest it from the dish. Even cilantro can be regrown from scraps! Use the same technique as with basil, putting the stem in a jar of water and waiting for roots to grow. A few months after planting it in dirt, your brand new cilantro plant will be ready to harvest! Isn’t it amazing how many foods you can regrow from scraps? You could create a whole garden just out of scraps! That will save you a lot of money at the grocery store! Have you ever regrown something you got at the grocery store? If you found this post helpful, here are some others you may want to check out.